Lacking creativity in your life? Or do your kids need a new outlet for their bundles of energy? Sounds like you and/or your kids are in need of a musical instrument! But which one? Read on for our top tips on how to choose which instrument is right for you! There are many benefits to learning an instrument, whether you’re an adult learner or a child just starting out. It contributes to better memory and discipline, has physical benefits – and is great fun, of course. But different people suit different instruments, for a number of reasons. Which instrument is best for you? We’ve broken down some of the most popular beginner instruments and who might suit them. Have a read and let us know what you think! Perfect for: the future rockstar or the social hobbyist. Arguably the most popular starter instrument among kids and adults alike, for a number of reasons. Guitar is accessible, fun and rewarding – there’s nothing quite like nailing Seven Nation Army or Smoke On the Water for the first time. It’s also great for coordination and memory – mapping out the fretboard is a great mental exercise that’ll always keep you on your toes. Guitar is also a great social instrument. Guitars are vital elements of bands and ensembles, and sound just as good in groups of 3 or 4 as they do by themselves. For this reason, guitar would suit kids who prefer spending their free time with their friends – and the same goes for adults! People learn on either/or, and while there’s plenty to consider, there’s no right or wrong answer. Most people start off on acoustic guitar, because they’re generally a little more affordable and they familiarise you with the physical aspects of playing before you explore your sound. Learning on an acoustic guitar helps build up your finger strength and gets you accustomed to chord shapes and basic melodies. If you want to build strength and familiarity more gradually, go for a nylon-string acoustic. These are softer strings that are easier to get to grips with, making them ideal for beginners. Once players get to grips with acoustic, they move onto electric guitar to advance to the next level. Electric guitars feel easier to play, but are generally more complicated because of the controls and other considerations (plugging into an amp, for example). If you or your little one is determined to play rock music, there’s no harm in learning on electric guitar, as long as you bear these extras in mind! Check out a couple of popular beginners’ brands here: EastCoast, Alvarez, Valencia and Sire. As mentioned above, nylon-strung acoustic guitars are incredibly popular for beginners. They’re easy to play and have a pleasant sound. But for an ultra-accessible option (that also happens to sound cute as a button), consider a ukulele. Ukuleles are compact 4-string guitar-style instruments originally from Hawaii, and are a common go-to entry level instrument. Brands like Mahalo and Alvarez make great options across all price points! Perfect for: the shy one or the humble hero. 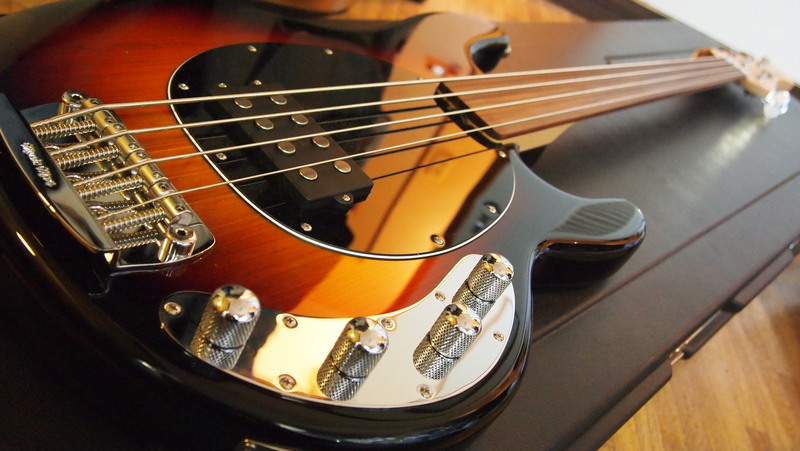 The bass guitar is a unique instrument for a number of reasons. It’s rarely the centre of attention, but if it wasn’t there, you’d know it. It also uniquely possesses the power to change the mood, sound and groove of a tune all at once – impressive eh? To put it more simply, the bass guitar is the glue that holds a band together without being in the limelight itself. For this reason, it’s perfect for the quieter ones among us; happy to be involved, but never one to admit the vitality of their role. Bass guitars most commonly have 4 strings that are thicker than guitar strings, with a slightly longer neck – and as the name suggests, the notes go way lower! This gives their sound a real weighty thump. Bass takes a bit more practice to get to grips with, but it’s well worth it – a good bass player can make or break a song! What is a short scale bass? A short scale bass is the same as a regular bass but with a shorter neck – that’s it. This makes them a little easier to get used to, which is ideal for beginners, kids or smaller people. This means that everyone can enjoy a bit of bass guitar without worrying about their size! Perfect for: the ball of energy or the coordinated one. Is your child in need of somewhere to channel their insane amount of energy? Or do you want to challenge your own personal co-ordination? Playing the drums is demanding, both physically and in terms of multitasking. It requires a lot of bashing stuff, stomping stuff, stretching, tapping, and so on. But a drum kit also has lots of components, each one needing its own level of attention. Most of the time, a drummer is playing at least two rhythms at once; rhythm #1 with their feet and rhythm #2 with their hands. Sometimes, there’s a #3 and a #4 too, and we’re sure somebody somewhere has figured out a #5. The point being that drumming is a great way to test your coordination skills. Subsequently, it’s a great form of both physical and mental exercise. Acoustic drums are bigger and louder, but feel more natural to play. Electronic drums are more compact and can have their volume turned down. Either way, the coordination and amount of energy is the same. So what’s best; acoustic or electric drums? Consider where you live (neighbours, size of rooms etc.) and you’ll probably make the right decision! Electronic drums are great for learning without making such a racket, but acoustic drums sound super cool and are rewarding to set up and play around with. The choice is yours! If you find yourself tapping everything you come across, you might be in desperate need of a percussion instrument. Rather than going for a full drum kit, it might be good to start with something like a set of bongo drums, a djembe, a woodblock or another percussion instrument. Play along with your favourite songs and get to grips with rhythmic playing. Perfect for: the committed music lover or the thinker. Piano is a great all-rounder. This is one of the reasons it’s another super-popular beginner’s instrument. Like guitar, it’s great for learning your favourite songs and playing along, as well as classical music and writing your own tunes. And much like drums, it requires a reasonable amount of coordination; left hand, right hand, feet, reading music. There’s a lot going on, which makes playing piano a great mental exercise. For children, it’s great for developing muscle memory, cognitive skills and co-ordination. In many ways, the same could be said for adult learners. 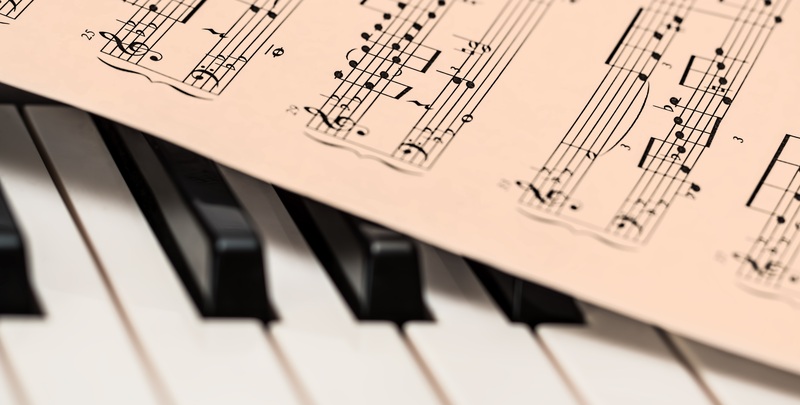 Piano music often has two staves (lines of musical notes) running at once, which makes it challenging but extremely rewarding once you familiarise yourself with it. You’ll learn to read 1 or 2 bars ahead of the music you’re playing, while reading pitch, tempo, bass and treble staves all at once – piano is a real thinking person’s instrument. A piano is an acoustic instrument; essentially a wooden box with strings inside, with hammers striking the strings, all controlled by a set of keys upfront. In the simplest possible terms, a keyboard is a digital replication of this action and sound. Modern keyboards are more realistic than ever before. Not only do they have great selections of onboard sounds (piano, organ, harp – you name it! ), but many have weighted or spring-loaded keys. This makes them feel like traditional weighted piano keys for an authentic playing experience. For beginners, there are arguments for both piano and keyboard. Learning with weighted keys is great for building finger strength and familiarity, but non-weight keyboards have a softer action which can sometimes be more suitable for young ones. Using lighter keys on a keyboard still allows you to gain experience and familiarise yourself with the ‘language’ of piano. If you want to know more about the difference between piano and keyboard, check out our guide to digital pianos! Perfect for: the loud one or the natural leader. Unlike the rest of the instruments featured in this article, the voice is something you’ve already got. With this in mind, anyone can do it. But, as with any instrument, it requires technique, practice and patience to truly make an instrument out of your voice. Vocals also require a fair bit of confidence – there’s no instrument to hide behind, apart from a microphone. You need to be comfortable with raising your voice and expressing yourself. On the flip-side, singing is often cited as a confidence booster for shy / budding musicians. Numerous studies have also demonstrated the therapeutic effects of singing, often helping people with conditions such as autism and dementia find a voice and express themselves. Do I need a microphone to be a singer? The short answer is no! As we said before, everybody has a voice – you can use it however you like. But if you plan to sing for a band, perform live or record your vocals, a microphone is essential. Many microphones are designed to specifically suit vocals, with further variations to suit either live performance or recording. Dynamic microphones are often straightforward, rugged mics that are perfect for plug and play. Condenser microphones require external power (phantom power) and are more sensitive, delivering a more detailed, responsive sound. If you’re looking for the best microphone for beginners, check out our selection here. Hopefully you’re feeling more comfortable with your instrument knowledge by now. Finding the best instrument for beginners isn’t easy, but each one has its pros and cons. Weigh them up and ask yourself the right questions, and you’ll get there! If you’re trying to figure out the best instrument for your child, check their school for music lessons (both curricular and extra-curricular) if you haven’t already done so. Teachers and music tutors can often provide valuable insight based on their experience – no harm in asking! If you’ve enjoyed reading this article, why not check out the rest of our Learn content while you’re here? And if you want to know more about what we offer beginners, head over to our site!